I’m so excited to finally be writing my first blog post, after numerous failed attempts to start one! 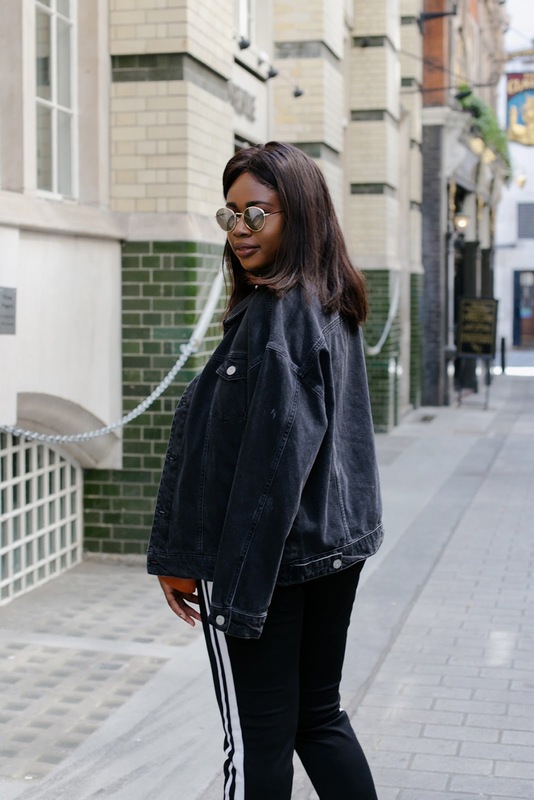 My first obviously has to be a fashion post (my first and I would say favourite love of all the things I blog about). I’m going to talk about the shoot I did in London with Bernadette (IG: @bernadettebks). I was pretty nervous as I’m fairly new to blogging and haven’t done many shoots. It was my second photoshoot I’d done in London. Bristol (my hometown) is great and has so many fab places to shoot (I like Clifton, Gloucester Road etc) but, there’s no denying that London has some great photo backgrounds. I’m definitely not a “natural” in front of the camera. In fact I’d go as far as saying I dislike having my pictures taken, which doesn’t go well wanting to be a fashion/ beauty blogger! We decided to shoot around the Oxford Street area close to Carnaby Street. I did my first photoshoot in Shoreditch, and was keen to try out different areas to add variety to my feed. You might be wondering why I choose to shoot with a photographer sometimes even though I’m only a “small” blogger. The reason why is because I think fashion/ outfit photos look best when someone else takes them for you. That being said it is hard to find people to take pictures for me often, though some of my friends and family have been very kind and done this for me. I like to post regular outfit posts on Instagram and be consistent, and using photographers allows me to generate a lot of content in one go. I shot three different outfits with Bernadette but I’m only going to talk about one in this post (otherwise the post would go on forever). For this outfit I chose to focus on the current “Sports Luxe” theme that is very popular at the moment. I’m hoping people know what I mean when I say this! Think joggers, trainers, hoodies etc. Both the top and trousers happen to be from Missguided (great for affordable fashion). On my top half I chose to wear a blouse. 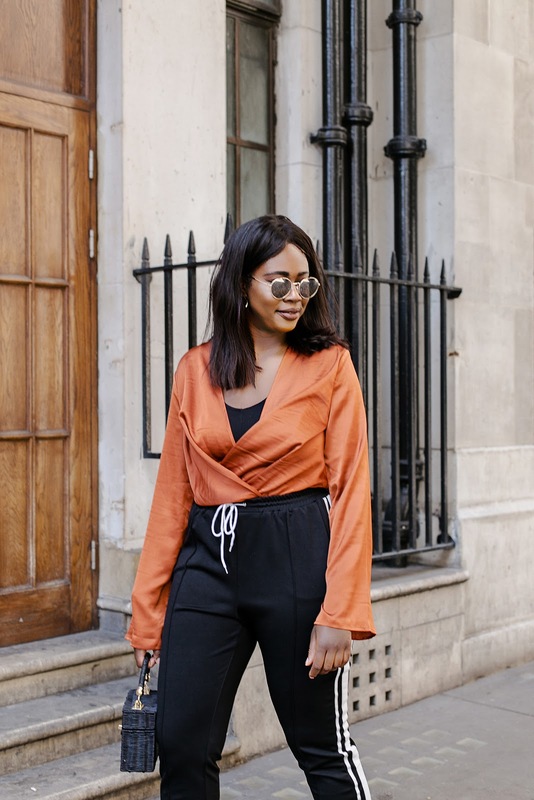 To be honest I don’t tend to wear a lot blouses these days, but I want to have a variety of styles of outfit on my feed not just casual – even though my usual style tends to me. I chose to wear a burnt orange coloured blouse. I don’t tend to wear a lot of colour either, but I actually think the colour looked good on me. I love wearing an all black outfit with pops of colour, I think it’s quite cool. The blouse is actually similar to a blouse I own from Zara (but cheaper!) So check Missguided if you don’t want to pay Zara prices. For bottoms I’ve gone for some tailored type joggers. Joggers are everywhere at the moment (thank Kim K! ), and in all honesty I rarely wear jeans these days. Joggers are so much more comfy – I don’t know what I’ll do when they’re not “in fashion” any more! You can definitely dress them up or dress them down. I chose to dress them up a bit for this outfit and teamed them with a pair of mules. I got these mules from Primark for just £10! I think they’ll go with a lot in my wardrobe because they’re plain black. I don’t tend to wear heels a lot because I’m fairly tall (not that that should stop anyone from wearing heels! ), but the heel’s so low on them that they’re comfortable and you barely even notice you’re wearing a heel so I think I’ll wear them a lot. Mules seem to be everywhere at the moment, so I think I’ll invest in another pair. I feel like they dress an outfit up a bit more. Jacket wise I threw on my trusty denim jacket. I think denim jackets are a staple piece and every wardrobe needs one. I got mine in the sale in Urban Outfitters last year and it’s by the brand BDG, but you can find one anywhere easily. A black one is a nice twist on the traditional blue denim one and went well with this particular outfit. The bag I carried is from Zara. I’m sure a lot of people have seen it, as it’s been very popular this season. I’m really into small bags at the moment, which is funny as I used to be someone who carried a bag the size of a suitcase about! I love this bag and use it all the time. I definitely feel like this outfit would be appropriate for people that work in an office, (as long as your place of work isn’t too strict!) but still want to look fashionable. I think the outfit still looks smart. Alternatively if you’re going out for drinks with friends/ partner and you want to get a bit dressed up and don’t want to wear a dress. You’ll see if you’ve seen my pictures on Instagram that I did switch this outfit up, showing that it is versatile. I swapped the blouse for a black crop top from American Apparel. This would be good for the warmer weather, and could maybe be worn on a night out. I also teamed the look with my checked Zara blazer which I’m loving at the moment. Maybe you don’t like the casual denim jacket with the look, and would prefer a blazer to make the look even smarter. I hope you enjoyed my first blog post. I’m still new to blogging at the moment so still need time to work on my writing style 🙂 I think the next post I do will be another fashion post. Feel free to comment below whether you liked the outfit and any fashion pieces you’re loving at the moment which I should check out. I also welcome any constructive criticism on my posts, and would love to know what future posts you’d like me to do! PS. Don’t forget to let me know if you a blog, Instagram account or even a Youtube channel that I should check out!